For us salon owners this time of year is a funny one. Preparing for our busiest time of the year, Christmas. With extended opening hours to fit everyone in and appointments filling up way in advance. Do you have highs and lows in the salon before Christmas too? Clients are holding off and waiting until Christmas for their appointments in order to save those extra pennies. And there is also an influx of craziness for those prepping for their Christmas parties. Panic mode in the quiet times? It doesn’t matter how long you have been in business when you look at that diary on a Sunday ready for the week ahead and there are gaps we immediately panic. Worrying about all of the overheads and how are we going to fill the gaps. But don’t! 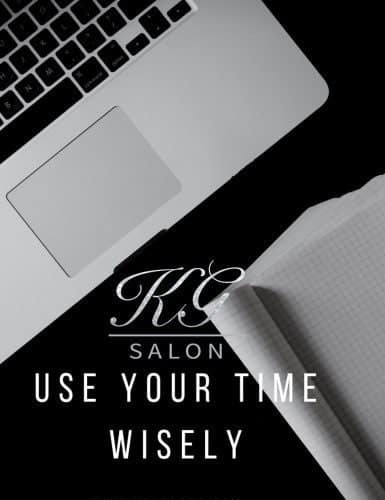 Instead use that time wisely and work ON your business. This is a perfect opportunity to hold team meetings and 1-2-1s. Go over the last year, check out the staffs client retention, see what the average client bills are and what there re-booking rate is. Work closely with them to show how the figures can be improved. Set goals with your team for the coming year. We are even planning dream boards in our salons so everyone can see each others dreams and personal goals. If the salon is successful, they are successful. And we can all meet our goals together. It’s a great time to give ‘miss you’ cards to clients you haven’t seen in a while. Go crazy on social media adding more content and being even more interactive. Make sure your website is completely up to date ready for the new year. You can even plan what your going to give your loyal client base for Christmas this year. Perhaps a goodie bag or a Christmas card with a voucher inside. It’s a perfect time time to redecorate the salon. No-one likes a salon that looks tired. You might be exhausted but it’s imperative to keep your salon looking fresh and presentable at all times. A nice salon will also keep your staff motivated. Staff training is essential! Maybe you want to bring out a new treatment ready for the Christmas rush or get ready to see in the new year with a bang offering a brand new treatment. If any of your staff need extra help in any areas of training then this is a great opportunity to get them on a refresher course or do some in-house training with them. January is always a great time for change. Raising your prices can always seem scary but, even if it’s just a pound per treatment. If you have 20 treatments a day, that’s an extra £20 a day, an extra £80 per week! Staff costs and bills go up yearly so your prices need to go up yearly too so it doesn’t impact your business. Always plan your year ahead. Your calendar should be packed full with 12 months worth of marketing ideas. This always seems like such a long job but if you do this in the quiet times you will be set up for the entire year. So even though your diary may be a little bit quieter you have plenty to do! And working on your business will bring you a lot more clients in in the longterm!